The franchise record 11-game winning streak is history now, but because of it, the immediate future looks pretty good for coach Ron Wilson's San Jose Sharks. The Sharks have moved into first place, and if they can hold on for another 10 games, they'll claim their third Pacific Division crown in franchise history. Even as the streak ended, the Sharks picked up a point by taking Edmonton to a shootout before losing Sunday in San Jose. In doing so, the Sharks extended their lead over second place Dallas to three points, while putting four points between themselves and third-place Anaheim. The Sharks, who have two games in hand on both the Stars and Ducks, have the inside track on the Pacific Division title, but Wilson is taking nothing for granted. "A bad week and you get left behind," he said of life in the ultra-competitive Pacific, where three of the League's top six teams, including last year's Stanley Cup champs, reside. The prize for winning what is arguably hockey's toughest division, then, is worth battling for: The winner gets the chance to play outside the division when they playoffs begin. The division champ will likely be the Western Conference's No. 2 seed -- behind Detroit -- while the second- and third-place teams seem destined to meet one another in the postseason's first round. If the season ended today, the Sharks would be the Western Conference's No. 2 seed, meaning they would face Colorado, while the Stars and Ducks would be stuck with each other. That's roughly the equivalent of Memphis being forced to play Kansas in the first round of March Madness. With just 12 regular season games to go, San Jose is either peaking at the right time, or they just wasted their best hockey about three weeks too early. The Sharks have certainly done it before. A year ago, they closed out the year by going 13-1-3, but then lost to Detroit in the second round. Two years ago, a 17-4-1 run down the homestretch got them no further than the second round, where they slipped on a banana peel against Edmonton. Whether or not their strong play extends into the postseason, the Sharks are clearly feeling it now. "We've got a lot of confidence," revitalized winger Jonathan Cheechoo told Mark Purdy of The San Jose Mercury News. During the streak, Cheechoo had 10 points. It may be pure coincidence, but the Sharks' run coincided with the arrival of defenseman Brian Campbell in a trade deadline deal from Buffalo. 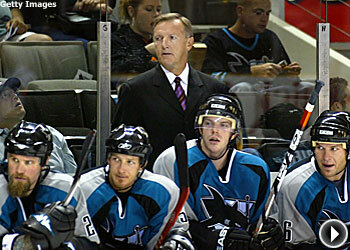 Before Campbell joined the team, the Sharks had snapped a five-game losing streak with back-to-back wins. The Sharks kept it going, picking up wins in Campbell's first nine games with the team. The 28-year-old defenseman remains one of the hottest Sharks, recording five points (1 goal, 4 assists) in his last three games. In goal, Evgeni Nabokov continues to perform like a Vezina Trophy candidate, going 2-0-1 in his last three starts with 0.97 goals-against average and .958 save percentage. Who's hot -- Shane Doan of the Coyotes has picked up 13 points in his last 15 games. Doan is on pace for a career high 76 points. … Anaheim's Ryan Getzlaf has 10 points in nine games, while Teemu Selanne and Mathieu Schneider each have three points in their last two games. … Brad Richards of Dallas has nine points in seven games. … The Kings' Dustin Brown has eight points in 10 games, while teammate Alexander Frolov has 15 points in 15 games, and Patrick O'Sullivan has 12 points in 11 games. … Joe Thornton of San Jose has nine points in seven games, while teammate Brian Campbell has five points in three games. Who's not -- Michal Handzus of the Kings and Steve Reinprecht of Phoenix are both scoreless in nine games. … The Ducks' Francois Beauchemin has not scored in eight games. … Kyle Calder of Los Angeles has not scored in seven games. … Dallas goaltender Marty Turco has lost his last two starts while recording a 3.06 GAA and .896 save percentage. 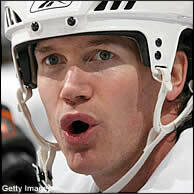 Ducks' defenseman Chris Pronger is serving an eight-game suspension. Missing out -- As the Pacific Division's top three teams jockey for playoff position, the Ducks will be without Chris Pronger. The Anaheim captain drew an eight-game suspension for his stomp-down on Vancouver's Ryan Kesler, meaning he'll be out of action until the final game of the season. While Pronger will be fresh for the playoffs, his absence will make catching San Jose for the division title all the more difficult. The ultimate price for Pronger's misstep could be that his team winds up faced with first-round showdown with Dallas instead of a lower-seeded team. Around the Pacific -- San Jose's Jeremy Roenick has been nominated for the Bill Masterton Trophy, emblematic of perseverance, sportsmanship, and dedication to hockey. Roenick has 11 goals and 24 points in 59 games. ... While the Sharks, Stars, and Ducks are looking to peak for the playoffs, the Coyotes postseason hopes are waning after a disappointing 2-3 homestand. Coach Wayne Gretzky was disappointed with his team's performance in a 5-3 loss to Edmonton on Saturday. "This was the biggest game of the year for us, and we got outplayed," Gretzky said. The Coyotes began the week in 10th place in the Western Conference, five points behind the Canucks for the final playoff position. The Week Ahead -- Anaheim plays a pair of crucial games within the division this week, visiting Dallas on Wednesday, and San Jose on Friday. The Ducks close their three-game road trip Sunday at Phoenix. … The Stars host the Southern California teams this week. First, they meet the Ducks in a Wednesday showdown before playing the Kings on Saturday. … After hosting San Jose on Tuesday, the Kings embark on a three-game road trip that takes them to Phoenix (Thursday), Dallas (Saturday), and Anaheim (March 26). The Coyotes began the week in Canada, losing 3-1 to Vancouver on Monday. They visit Edmonton tonight before returning to Phoenix to play Los Angeles (Thursday) and Anaheim (Saturday). … San Jose visits Los Angeles (Tuesday) before traveling to Minnesota (Wednesday) and Anaheim (Friday).